What is more fun than a candy cane playland?! Our Candy Cane Moon Jump will provide your little guests with hours of fun, with lots of room to jump and play! This amazing inflatable looks like it is straight from the North Pole and is sure to be the centerpiece of your next event. 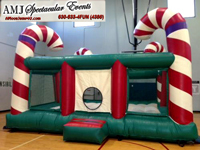 Featuring a festive red and green play area and larger than life candy canes, this moon jump is sure to add some holiday spirit to your next holiday party or event! The large bouncing area in the Candy Cane Moon Jump is perfect for your crowd, but it also includes a ton of other activities to entertain and delight! Your little guests can maneuver around an inflatable play area, crawl through a circular entrance, and jump the day away! AMJ Spectacular Events is your complete party rental company, designed to fit any sized party at any budget. We take great pride in being family owned and operated while being supported by our dependable staff. Our Event Specialists have years of experience planning events for backyard parties, corporate events, picnics, country clubs, trade shows, churches, colleges, and holiday parties. Call us, (630) 833-4386. Let AMJSE take care of all the work - we will deliver, set-up, and take down your Candy Cane Moon Jump, so all you have to do is enjoy! Contact us now to talk about this, other inflatables, or about the hundreds of other rentals we have ready to help make your holiday party a spectacular event!